The first level of MMA, Isle Hell City. Believe it, this design has flaws. I have concerns first-time players aren't going to know what to do. Why is this? Well, my game is very different than other games that use GZDoom as their engine. Also, try playing the first level and see if you can complete it. Yes, today, we'll compare this level to older World of Kirbycraft levels and newer ones from Mary's Magical Adventure to see how each stands in linearity. Full map of Stupid Hills (2-1) from WoK v1.4.5. The mouse cursor looks nothing like my wand cursor! Just looking at the map, it'll confuse you! It's obvious the level would lead you to the top-left corner through one of the many paths but all of the paths, as said before, are just corridors and each path overall feels separate, with no way to change paths easily. 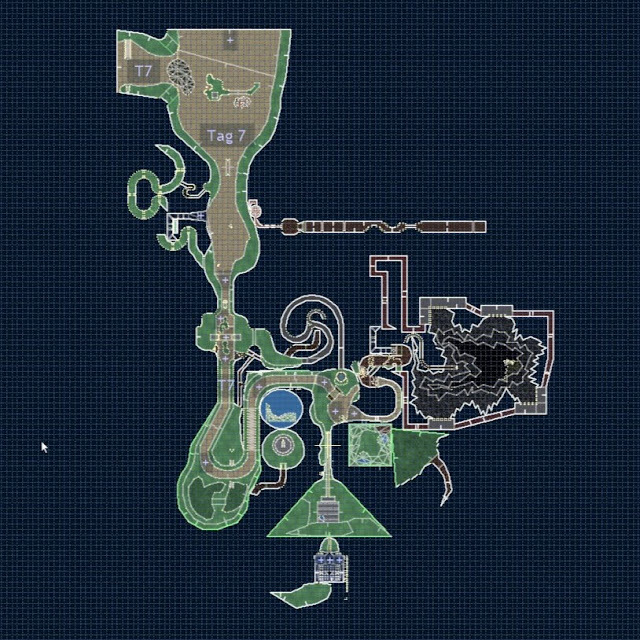 The right side is a secret cave area where a Special Stage entrance could be found. The problem with this area's the same as the other paths in this level, it is separate with only one way back onto the path, unlike later Mary's Magical Adventure level design that makes it quick to return to where you were before finding the secret area (and with ways to switch paths unexpectedly). Overall, I'd say this level design is mostly linear, even with the multiple paths. After this level, I began designing Hell City. In these early versions, it was ugly but anyone can tell it's the same place that's in v1.9! This level was based on City Trial from Kirby Air Ride since I liked that island's freedom to go anywhere, anytime. Also, I made this because World of Kirbycraft was a machinima series that used Kirby Air Ride gameplay, most of that being City Trial. 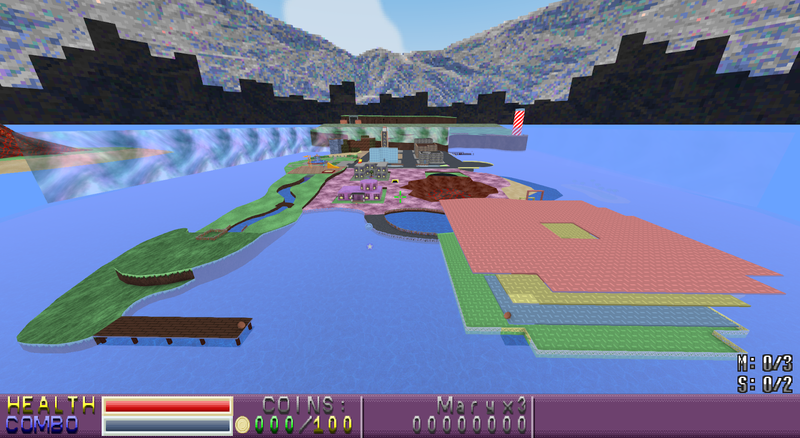 While the other level I was making at this point in time, Stupid Hills, was very linear with bland corridors and weirdly-placed secrets, restricting the player's freedom, Isle Hell City was the complete opposite, letting the player go anywhere they wanted and allowing them to try out their weapons and abilities. Its open and free design proved to be a problem, though. In Kirby Air Ride, there wasn't a place you had to drive to to win, so everything looped around if you followed a path around the island, even through the underground area. In World of Kirbycraft, though, the goal was a set location you had to run to, so I converted the underground area into a tunnel that led out of the city. I knew the player would just run there and complete the level within seconds unless I gave the player an objective to get the key to exit the area but due to the level being open, I couldn't do that, making the player find a key. This is what made me introduce the HCPD and the GTA-esque Wanted Level system, which keeps you from leaving the island until enough of them are killed. After this, the player would have to get five Wanted Level stars, grab a green key from a cop, then open a room in the HCPD and leave quickly. There are many problems with this, though. 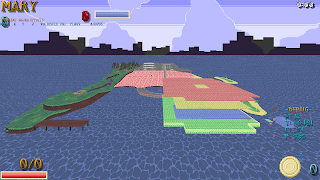 Nothing really tells the player to do this, so they could get lost on the island, the first level of the game, which has very different gameplay from every other level in the game! Also, nothing says you have to get five Wanted Level stars, get the key, then exit. Other levels don't require that many steps to complete them, either; In other levels you just have to find keys to open marked doors, kill monsters, and find secret areas, then once you have a good amount of them found, run to the exit, much better. 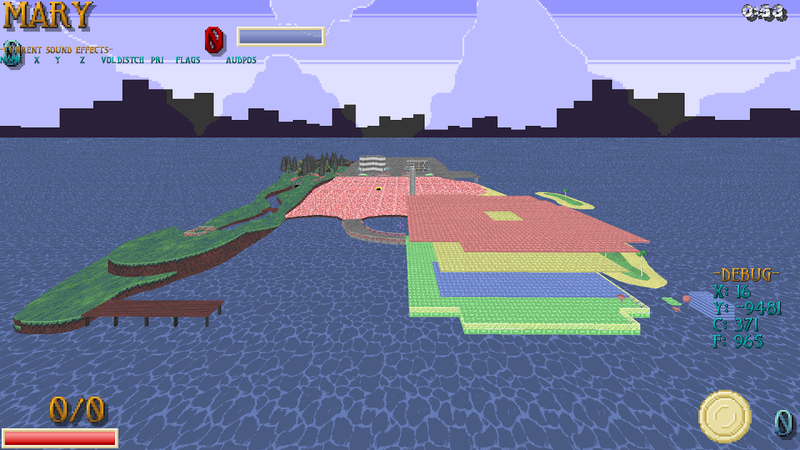 With my level design today, which feels open and free but is really linear, Isle Hell City's confusing, fully open level seems pointless to keep in the game. 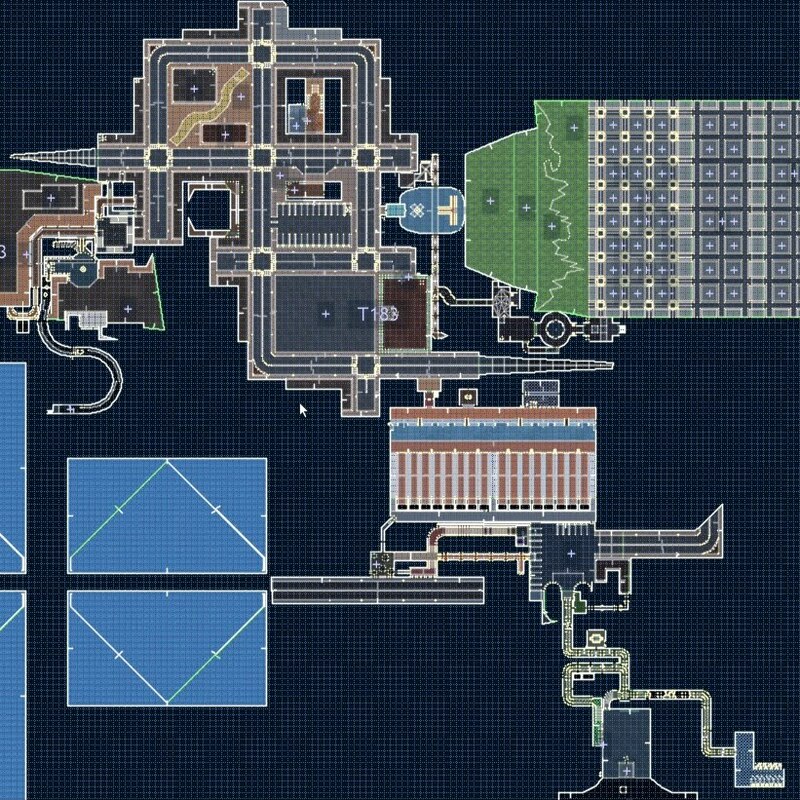 Before talking about my plans for this level, let's compare to the other two levels in the game. Without thinking much, you may think Mary's Magical Adventure's level design is the same as the older World of Kirbycraft versions, but you'd be wrong! My newer level design is more open than the older level design I made years ago but still ironically does a better job at leading the player to the exit while feeling like it isn't subtly doing so. 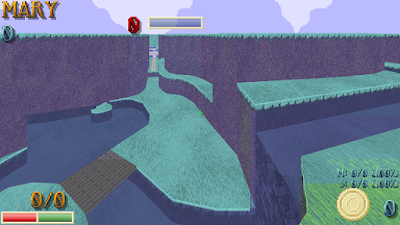 By comparison, the old level design felt like it was trying to force you down paths, some of which led you to secrets as they were their own paths, while with the current level design, secrets are only off to the side of the main paths, preventing the player from getting confused upon entering secret areas. Compare the map on the bottom to the one above it; Although I haven't marked anything on either map, you should be able to make out a path on both, but notice how many paths appear to branch off into nowhere on the World of Kirbycraft map! This isn't just because that level was never finished, but those are he secret paths. Looking at the bottom map, you can see a lot of the areas that lead nowhere are just out of bounds areas for polyobjects (bottom-left) and the view from Xane Corp.'s window (upper-right), but you can see the level starts at the left side and goes down-right to the end at the bottom. With the World of Kirbycraft map, it starts at the bottom and ends up at the top-left. In fact, watch me go through all of the non-Special-Stage levels in the current version of Mary's Magical Adventure; You'll see how most of the levels have a logical path but the first level doesn't, with Mary running everywhere to fight HCPD then returning to the building to open the room and escape. Really, this video is the best proof that the first level stands out in a bad way compared to the other levels. This was the level design I had to deal with outside of Isle Hell City as I felt I couldn't do any better, but the other two levels I've since made proved me wrong. Therefore, in the future, I have plans to get rid of the first level entirely. It's so out of place with the random cop fight (which the Battle Arena minigame handles better, anyways). At one point in the first level, there'd be a big button your character would land on that would forcibly kill a nearby cop, which would be done so the player would commit a crime that sets off the dispatcher, no matter if they killed a cop before this or not. For Xane, he would break out of jail during his story so the dispatcher would have a different reason to not like him. As the player ends up on Uroboros, the dispatcher would be heard alerting the cops on-board that the criminal that killed cops is there. I suppose this would fix the issue with removing the dispatcher's initial "encounter" with the player. After this, the paths would merge, allowing Mary and Xane to reach the big building that starts off 1-2. If no alternative path's made for Xane, the basketball court he visits in 1-2 will be made available to both characters and Xane would start the level at the same place as Mary. Xane this is an awesome blog!!! I read it and watched the video..
Really informative and shows how u and ur game have grown..i.love it! !